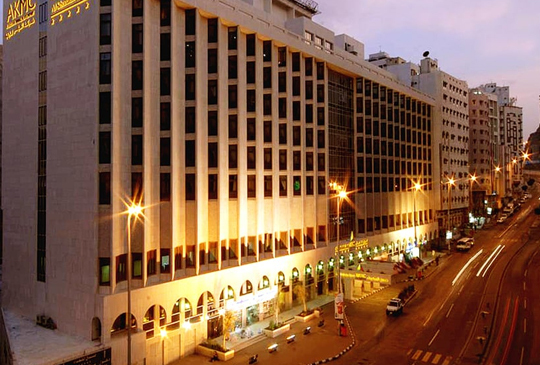 Set in the historic Ajyad neighborhood, this upscale hotel is within a 15-minute walk of Zamzam Well, Masjid al-Haram mosque and the sacred site of Kaaba.Warm, traditionally decorated rooms feature flat-screen TVs, minifridges and free Wi-Fi, plus tea and coffeemaking equipment. Suites add plush living rooms; upgraded rooms provide butler service. Room service is available 24/7.Amenities include a conservative restaurant and an expansive lobby lounge. This towering, upscale hotel is an 8-minute walk from the Al-Masjid an-Nabawi mosque and 7 km from Quba Mosque.The refined rooms offer free Wi-Fi, flat-screen TVs and minifridges, as well as tea and coffeemaking facilities and 24-hour room service. Suites have living rooms and upgraded suits add dining areas. Some rooms and suites provide access to a lounge with complimentary breakfast, drinks and snacks and/or views of Masjid al-Haram mosque or Mount Uhud.There’s a bright restaurant serving international cuisine, a cafe and a gym. Other amenities include 3 meeting rooms and a spa with a sauna and steam rooms.